Losing weight is one of the most popular New Year's resolutions. Unfor­tunately, it's also one of the most difficult to stick to so if you need a little extra help then why not try the Celebrity Slim Program. It's available from our online pharmacy right now so what are you waiting for?! One of the biggest problems with dieting is feeling hungry all the time. While skipping meals may make you think you're being healthy, it's actually hugely counter-productive: starving yourself interferes with your metabolic function, meaning you're more likely yo binge and retain more weight in the future. 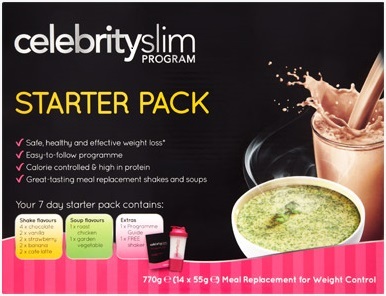 Celebrity Slim allows you to eat meals or snacks six times a day, ensuring your metabolism keeps functioning properly and making sure you're not hungry all day long. The three-phase Celebrity Slim Program starts with the Trim Phase. So, how does it work?